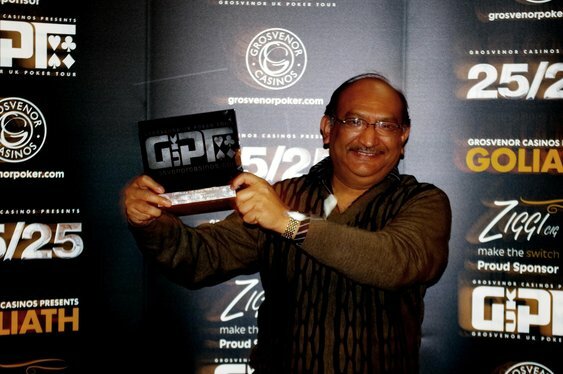 The second leg of this season's GUKPT came to a close on Sunday night and when the lights had been turned down inside Manchester's G Casino it was Ali Mallu lifting the winner's trophy. After battling his way through nearly 200 players, the GUKPT regular found himself sat at a tough final table after a final day of action. When the final 14 players returned on Sunday, it was the always dangerous Mallu who looked one of the most likely to push for a place in the finale. As the action progressed and the final table moved closer, it was Nigel Ventre who sent Alex Golubevs to the rail one place short of the final table. After the latter moved Qs Jc, Ventre called with kings and after the board didn't throw up any surprises, the £1,000 Main Event was down to nine. The first elimination of the night was Katie Swift and in her tracks were the likes of Asif Choudry, Jorge Rosa, Mark Davey and the aforementioned Ventre. That spate of eliminations left Mallu as one of the chip leaders and with a few well timed (lucky?) moves he managed to take out Tim Hickling with Kh 5h vs. Ac Td. With just three left, Tom Dunwoodie was able to oust Liam Hooks in third and set-up a heads-up showdown with Mallu. Dunwoodie's momentum was unable to earn him the upper hand against the always dangerous Mallu. Staring at the board showing 3h Qd 9c Kc, Dunwoodie took a chance with 4c 3c but couldn't get there against Mallu's Kd 8c after the board was a blank 2d. After the chips had been cleared away and the confetti had fallen, a jubilant Mallu lifted the winner's trophy and collected £59,000 to the cheers of the crowd. The 25/25 Series makes a welcome return later this week with £25,000 guaranteed in both Coventry and Bradford. The buy-in is £200+£20 with players able to choose from three opening flights at 7pm on Thursday and Friday and 4pm on Saturday. Qualify online with Grosvenor Poker.